The Rainy Dream is Princess Peach's kart in Mario Kart Arcade GP DX. 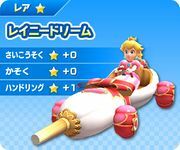 The kart is long and pink, has a ribbon decorating it, and the front has a light brown bar protruding from it. Its alternate colors are orange and blue. This page was last edited on March 6, 2018, at 18:56.